17.07.2010 JAPANESE FIAT 500 OWNER'S ROLL INTO KOBE'S FRUIT & FLOWER PARK FOR "PICNIC"
The Fiat 500 has proved an instant hit across the world and especially so in Japan were a new club Bambino was formed recently to cater for the tiny car and this month many owners gathered together in Kobe for the second time for a "Picnic". 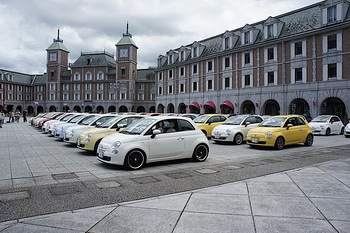 The Fiat 500 has proved an instant hit across the world and especially so in Japan were a new club Bambino was formed recently to cater for the tiny car and this month many owners gathered together in Kobe for the second time for a "Picnic". The first time the owners congregated on the immaculate paved plaza of the Kobe Municipal Fruit & Flower Park was last January, just weeks after the club had been formed, providing an instant outlet for the enthusiasm of the Japanese buyers who have been seduced by the new model's charms. 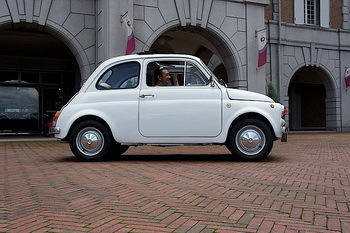 To celebrate the third birthday of the 500 which fell earlier this month the members of Bambino headed back to Kobe for a 500 "Picnic", and in particular they headed to the Municipal Fruit & Flower Park. This famous location is situated in the northern part of Kobe, and was specially constructed to imitate the architectural style of the buildings in Europe, making it a perfect setting for this European icon, and providing the owners with the excellent leisure facilities of the hotel and the amusement park. That first "Picnic" event a year-and-a-half ago drew drew sixteen gleaming examples of the new 500 model which were perfectly complimented in the plaza by a pristine example of the original motoring icon, a model first launched half a century ago; this time the enthusiastic Bambino club doubled that number to thirty 500s, and again drew on representation of the first historic model to carry the 500 name. The array the diminutive Italian cars that lined up on the plaza outside the hotel and leisure facilities, the club was given special permission to use this prestigious area, covered every genre of the current-generation 500 including the high performance Abarth model and several extremely personalised examples, reinterpreted by their proud owners taking advantage of the diverse range of custom and tuning products that have filtered onto the Japanese market for the Italian Supermini. 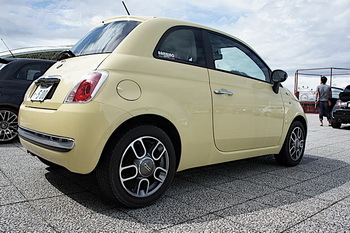 (Customised 500s pop up at most of the important styling and tuning shows on the Japanese calendar). 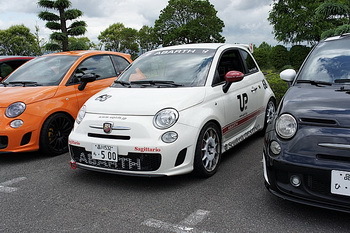 Also on show was the unique Abarth 500 "Elaborazione", a project created by Japanese performance and accessory company, Any's International, which debuted at the recent Tokyo Tuning Show. A lot of water has flown under the bridge since that first meeting of the Bambino club in January last year as the 500 has steadily gained in the affections of Japanese automobile enthusiasts', most notably is that the sports-focused Abarth brand was launched in the country last spring, first with the arrival of the Abarth Grande Punto, which was then quickly followed by the Abarth 500, although private imports had already seen the tiny Scorpion car represented on the Japanese roads.